This friendly exchange between Brian D of the USA and Dr Jonathan Sarfati of CMI-US (formerly CMI-Au) concerns chronological aspects of the time line of the Flood and Noah’s life. Not that I should consider myself greater than Ussher or all the other ancient scholars, but I find continual discrepancy in all the recounts of the early Pre-flood fathers. This first came to light when I could not reconcile Methuselah’s death, the Flood, and Arphaxad’s birth as all being simultaneous and instantaneous. We can assume that Methuselah died a week before the flood and that the flood took place when Noah was 600.2 (a simplified rendering of 600 (2 months (17 days /30) /12)) years old (Gen. 7). Genesis 8 tells us the flood lasted a little over a year. Then Genesis 11:10 states that Arphaxad was born 2 years after the flood when Shem was 100. But If Noah was 500 when he had Shem (Gen. 5:32) and 600 when the flood came, then the math does not add up. All this assumes that sons are born on fathers’ birthdays, that is, Shem is born on Noah’s 500th birthday. This is the erroneous assumption I find that has been handed down. To be born in one’s 500th year could be anywhere between the 500th birthday and the day before the 501st birthday. Therefore I have assumed that all fathers were their age plus half a year at the birth of their sons. The erroneous thinking also assumes that the men have died on their birthdays when in reality they could have been up to a year minus a day older. I understand that living a perfect set of years is traditional, but not always practical. By adding half years to Seth and each successive generation and bringing the flood about when Noah was 600.2, this places the flood at A.M. 1660.7, or 8 months and 12 days into that year, a full 4 years and more beyond the accepted 1656. This also places the flood starting 1.2 years after Methuselah’s 969th birthday. In reality Methuselah could have died one day shy of his 970th birthday or roughly two and one half months before the flood. There is some flexibility. If one is flexible with the extra half year in Methuselah and Lamech’s term before fatherhood, the flood could be brought right to Methuselah’s death and A.M. 1659.7. The flood then lasts for a year and ten days. Arphaxad is born in Shem’s 100th year and by assumption Noah’s 600th year. But the Flood started in Noah’s 600th year and ended in his 601st! Since we know the exact date of the Flood in relation to Noah’s age, I assumed that Shem was born 1 day shy of Noah’s 501st birthday and that Arphaxad was born one day shy of Shem’s 101st birthday. Given this, Arphaxad is then born 9 months after the flood ends, or 1.8 years before the flood starts. If Moses is to round up in this case, we see that two years could be acceptable. However, to accept this rounding as a way to rectify the dates, it seems we must also accept the average extra half year before children were born to fathers. This results in the previously mentioned year of A.M. 1659 or 1660 for the flood. The Bible says Noah was 500 when his first son (Japheth) was born. Noah was 500 when the first son was born, 600 when the Flood came, so there are 100 years between them. But Shem had Arphaxad 2 years after the Flood, when he was 100 (Gen. 11:10). Therefore Shem was only 98 when the Flood came. Ham is stated to be the youngest (Gen. 9:24), so Japheth must have been the eldest. 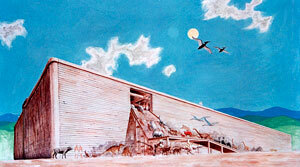 When God gave Noah instructions to build the Ark, it was to hold Noah’s three sons and their wives (Gen. 6:14–18). If we allow 30 years for them to become old enough to marry, this would mean Noah had about 70 years. That the passage is not saying that Noah begat triplets is further supported by comparison with Terah’s three sons. Evidently Terah was 70 when Haran was born, not all three. From Gen. 11:32 and 12:4, we can work out that Terah must have been 130 when Abram was born. Same grammatical construction, and also see below why it must be true of Noah as well as Terah. I am not dogmatic that the sons are born on the fathers’ birthdays. But at most, 20 years could be added to the timeline from Genesis 5 and 11, and I am not willing to quibble about that. The 120 years (Gen. 6:3) seems to be the time of the corruption of the sons of God mating with the daughters of men to the time to the Flood, not individual longevity. I appreciate your prompt and precise reply to my inquiry. However I find a tiny verse that can lead to the dispute in this matter. Gen 10:21 is not consistent across translations. The NIV states that Japheth is the elder; NAS states that Shem is the older brother of Japheth; The Message makes the same translation; NLT favors Shem as eldest with a footnote stating the opposite could be true; KJV and NKJV hold to Japheth as the elder. The Italian Bible favors Japheth whereas the French favor Shem as the eldest. Luther’s German Bible is a bit inconclusive but seems to go with Japheth. This tells me that there is enough uncertainty as to who is the eldest. Should it be Shem, I still submit my study as a possible solution. I agree that Adam to Abram could not add more than 20 years. I am submitting that 10 be adequate and reasonable. Further, I am unresolved on what 120 years could mean. There is good reason to believe it refers to either a single time period of an event or a new term of longevity. Given the way Hebrew can work, it could even mean both at the same time. I do not hold strictly to one or the other. Matthew’s genealogy intentionally had gaps—he tells us that he picked 3x14 names (Matthew 1:17), possibly because this is the number of David’s name in Hebrew. Genesis 5 and 11 are different because they are chronogenealogies. One other point on Ussher, if I may. If Adam were created in 4004 BC, this leaves ~840 years between Jacob and David. Both Luke and Matthew give 11 generations in this span, though it is more on the order of 14. This would give an average of 60 years in a generation. From Arphaxad to Jacob it is seen that 30 is more typical (45 being average) as is the time span from David ( BC 1040) through Solomon. I further submit that Ussher was off by at least 350 years. This makes the Hebrew calendar much closer to my calculated values. It’s important to translate Scripture in a way that doesn’t contradict other Scripture. That’s why the translations that make Japheth the oldest are right; Shem is two years younger. Shem is listed first sometimes because he was the ancestor of Moses (and of Christ). 120 year cannot mean longevity, because people lived far longer lifespans well after the Flood. So the reference must be to the time mankind had before the Flood. Matthew’s genealogy intentionally had gaps—he tells us that he picked 3x14 names (Matthew 1:17), possibly because this is the number of David’s name in Hebrew. Genesis 5 and 11 are different because they are chronogenealogies. See the differences explained in The Virginal Conception of Christ and Biblical Chronogenealogies..
Ussher’s calculated date is very similar to that of other scholars, so I suspect he was close to the mark. See this list in Young Earth or Old Earth: What is the recent aberration?